Recently Wärtsilä announced that they are going to team up with an international group of shipping industry companies and organisations in a project to develop a concept for equipping future dry bulk carrier vessels with natural gas propulsion. 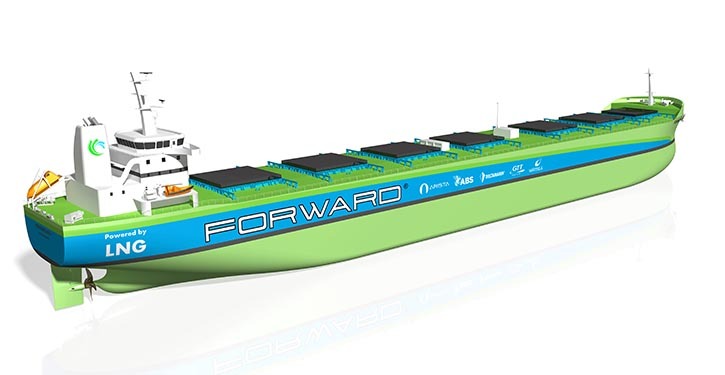 Project Forward is led by Athens-based Arista Shipping. It began officially in May 2015 with the aim of developing a commercially feasible natural gas powered dry bulk carrier design capable of complying with the International Maritime Organization’s (IMO) Energy Efficiency Design Index 2025 standards, as well as with all relevant emission reduction regulations. In addition to Arista Shipping, the other parties involved in the project are Finnish ship designer Deltamarin, the Houston based classification society American Bureau of Shipping (ABS) and GTT, the French LNG membrane containment system designer. 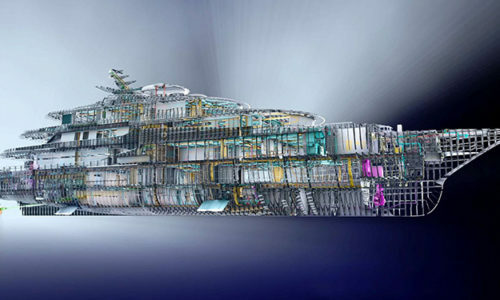 The Wärtsilä 31DF dual-fuel engine is likely to form the basis of the concept’s propulsion system. Introduced in June 2015, the DF version allows the use of either methane / natural gas or conventional marine fuel oils. 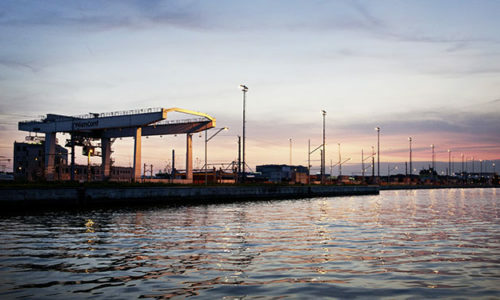 While 2-stroke engines are the conventional choice for vessels of this type, the supreme efficiency of the Wärtsilä 31 engine makes it a competitive and viable alternative option. 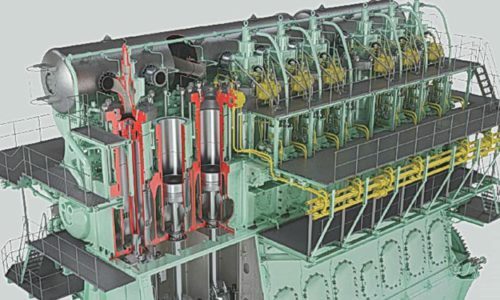 “Wärtsilä has been selected to participate in this important project because of our depth of experience in gas propulsion solutions, our strong position in 4-stroke engine technology, and in particular because of the state-of-the-art Wärtsilä 31 engine. This engine has not only taken efficiency to a new benchmark level, but in gas-mode is IMO Tier III compliant without the need for any exhaust cleaning systems. 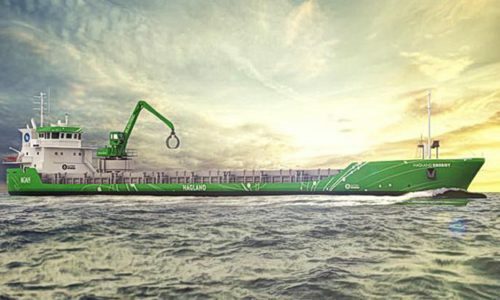 We are proud to be a part of this future-looking project, which could eventually be applied equally well to other types and sizes of merchant vessel,” says Aaron Bresnahan, Vice President, Sales, Wärtsilä Marine Solutions. 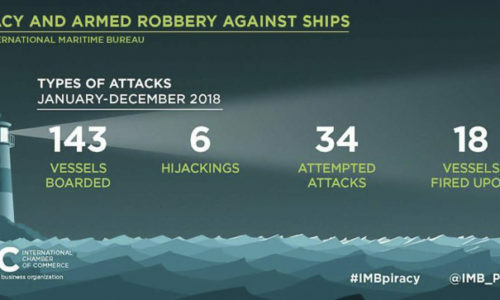 “Project Forward aims to become a milestone for the shipping industry and in particular for owners and operators of cargo ships. Owners must decide within the next 5-10 years whether gas as fuel is a practical means of compliance with lower emissions standards and this project will enable all of us to understand its feasibility. We welcome Wärtsilä’s involvement, as it is a company with great experience in this field,” says Arista Shipping Principal, Alexander P. Panagopulos. The project is to be presented as a topic at the Posidonia 2016 conference and exhibition, to be held in Athens, Greece from June 6 to 10. Wärtsilä says that they have long been a marine industry pioneer in the development of gas and dual-fuel engine technologies. 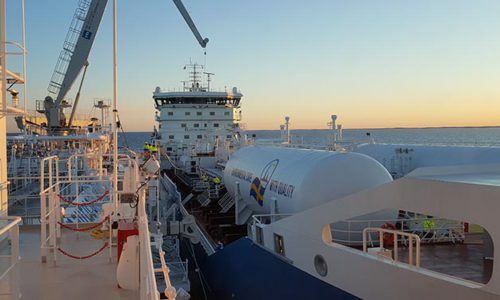 The company has also led the way in offering complete fuel gas handling and storage systems, as well as gas propulsion systems for all types of vessels. 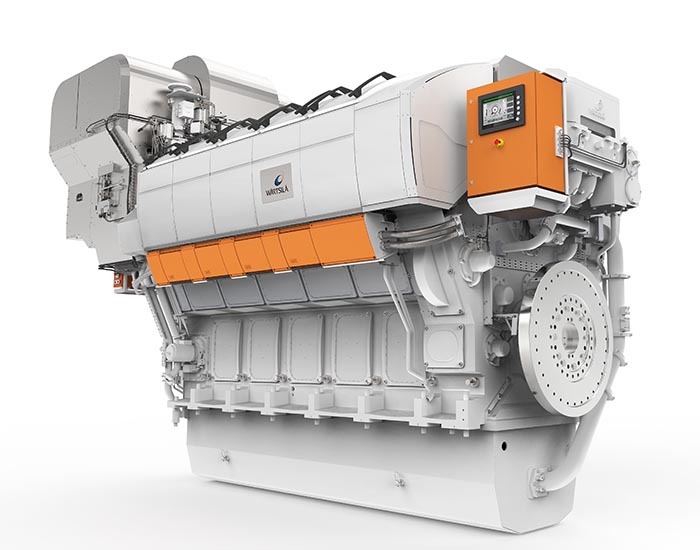 According to the Finnish Engine Manufacturer is the Wärtsilä 31 the first of a new generation of medium speed engines, designed to set a new benchmark in efficiency and overall emissions performance. It is available in 8 to 16 cylinder configurations and has a power output ranging from 4.2 to 9.8 MW, at 720 and 750 rpm. This 4-stroke engine has the best fuel economy of any engine in its class, says Wärtsilä and continuous: At the same time, it maintains outstanding performance across the complete operating range. Its modular design enables a significant reduction in maintenance time and costs, thereby improving power availability and reducing the need for parts.